Greenacre mechanic, Anthony Ters, is one of nineteen young Australians who have won the right to compete at the Global Skills Challenge following his success at the 2018 WorldSkills National Championships. Anthony and his Australian team mates will take on international competitors from 16 countries including the United Kingdom, China, Russia and Brazil in 24 skills competitions across the 4-day event. 22-year-old Anthony, who is employed by Sutton Motors Chullora and is a student at Mount Druitt TAFE, won a bronze medal in the Automobile Technology category at the 2018 WorldSkills Australia National Championships. 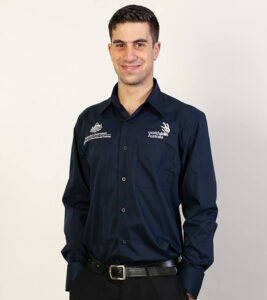 Anthony’s win secured his place in the WorldSkills Australia training team, and he is hoping that the last seven months of training has set him up for success at the Global Skills Challenge, which will be the final stage for selection in his bid to become a Skillaroo; an elite team of young Australian apprentices and trainees who will represent Australia at the WorldSkills International Championships to be held in Kazan, Russia in August. Anthony is looking forward to the Global Skills Challenge and potentially representing his country at the WorldSkills International Championships. “It would be a fantastic opportunity to represent Australia,” he said. “I love how hands-on working with cars is; I never stop learning because there are new techniques to perfect. “The WorldSkills team are highly supportive; the best thing about competing is pushing myself to grow and meeting new people,” he continued. I’ll also see what the other competitors have to offer,” he continued.